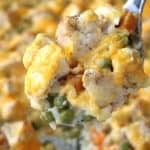 My Easy Cheesy Chicken and Rice Casserole is perfect for a quick weeknight dinner. A simple comfort food dish that is sure to become a regular on your dinner table. Dice chicken into 1/2" cubes and brown in medium skillet. Combine soup, broth, rice, onion, garlic, vegetables, salt and pepper in 8x10" baking dish. Add chicken on top and cover with aluminum foil. Remove foil, top with shredded cheeseand bake another 10 minutes.